Lock & Co – WHAT IS JAMES WEARING? “If you want to get ahead and get noticed, then get a hat”—so went the old slogan created some three quarters of a century ago by the British Hat Council (for those who are interested in these things), and we couldn’t agree more! 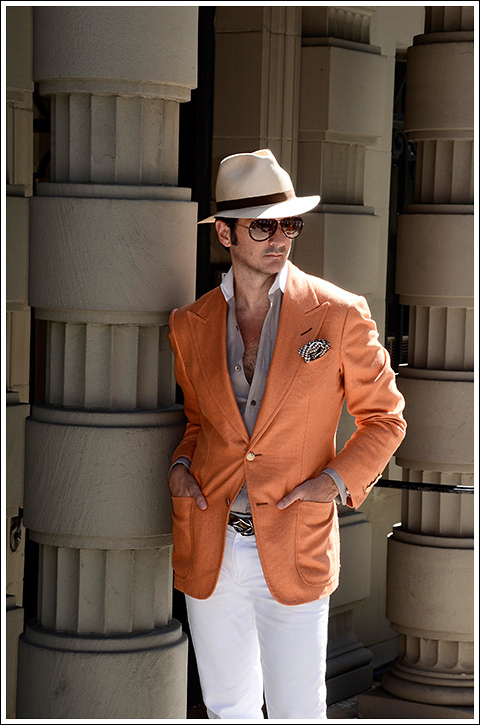 Donning a hat is the most perfectly lovely way to add that extra umph and panache to an ensemble. There was a day not so long ago when men and women wouldn’t think of leaving the home without wearing a hat, and then sadly, and somewhat inexplicably, proper hats went nearly completely out of fashion, becoming a relic reserved primarily for the particularly nostalgic among us. It’s a bit unclear why hats are coming back with such renewed vigor—in fact we’re just as unclear as to why they have virtually disappeared—but certainly some high profile royal weddings, some successful movies, and popular television dramas can’t have hurt in bringing them ever so slightly back. Whether one attributes the shift to popular culture, the epicyclical swerve of fashion, or a greater zeitgeist, we here at WIJW are taking notice, and we’re wholeheartedly on board with this super-stylish accessory. In short, we’re bringing hats back. I plan to wear more hats as part of my various ensembles, looking to marvelous hatters like Lock & Co for my selections. For today’s post, I’m completing a late summer look with this uber chic vintage Lock & Co. wide brim, fine parabuntal palm fibre hat, Tom Ford “Spencer” jacket in tangerine silk basket weave, brown end on end cotton shirt with contrast white collar, brown and ivory silk glen plaid pocket square and (not shown) brown suede tasseled loafers, Gucci python belt with silver buckle, Seaman Schepps shell with coral bead cuff links, sunglasses by Tom Ford and my fragrance is Creed Orange Spice.